Matt Stensland is a journalist for the Steamboat Pilot & Today, where he has worked since January 2006. 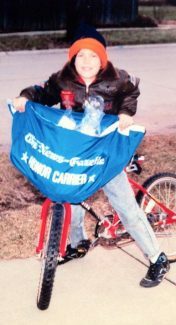 His newspaper career started at age 9, when he began working as a carrier for The News-Gazette. Matt started working at the Steamboat paper as a reporter, covering the town of Hayden, real estate and business. He later served as the newspaper’s first full-time videographer. He currently covers law enforcement, courts and the Steamboat Ski Area in addition to his work as a photographer. In 2015, Matt compiled the book “Ski Town Shenanigans: The Best of the Steamboat Springs Police Blotter.” Matt has a bachelor’s degree in print journalism from the University of Illinois at Urbana-Champaign, and he grew up in Urbana. When not working, you will most likely find Matt soaking at the Old Town or Strawberry Park hot springs.